There are thousands of brands out there with their own versions of the sewing machines. However, not every machine is the one to go for because there are equally thousand things to consider before you buy a product. That’s obvious, right? If it is, then we’ve brought forth a list of best sewing machines to buy right now, at this moment. They have been listed here based on the three metrics a buyer should look for in a sewing machine – the machine’s complexity or skill level, you own skill level, and your sewing needs (embroidery, creating flair and frills etc.). Let’s delve into the list. As the name suggests, this sewing machine has some tricky business going on, thanks to its computerized controls. But that does not limit its capabilities, which can be credited to the feature it is loaded with. In a 70- or 100-stitch version, you get a metal case that houses a machinery rendering automated needle threader, backlit sewing surface, speed controller, and controls to keep the speed of it in check. Whoever uses Singer 7258 praises its ease of use. I mean you just unbox it and start using it in just 5 minutes. Just as you run it, you’d notice how quiet it is, which is a good thing if you sew for hours. However, no matter how much it is automated or versatile (even beginners can use it), there are some pitfalls. For example, the bobbin and pedal are made of plastic while the rest of the case is of metal. Also, it can be used for quilting, decorating, or just doing some basic stitches, but when it comes to heavy fabric, you might want to go for a bigger version. If you aren’t tech savvy, forget about the previous model and buy this one. It is manual and yet extremely easy to use. The manual dials can be accredited for it because they can easily let you control the width of the stitch, length of it, and type. The machine is aptly suited for a four-step buttonhole and 18 different kinds of decorative stitches. Its presser feet is also considerably higher to let you accommodate thicker fabric, unlike the Singer 7258. And if I talk about its sewing panel or surface, it is just fine for its job. Overall, plastic-cased Janome Magnolia is a good value for beginners that are looking for a simple yet efficient machine. A 60-stitches machine, the Brother CS6000i is yet another beginner level sewing machine that is even liked by pro sewers. For what, you ask? For its impressive and easy to use interface – an LCD screen with controls to let you select stitches and control speed of sewing. As you might have guessed, the model is the perfect amalgam of convenience that has been rightly priced. What I generally like about this model is its extended sewing surface and a chart of stitches. Also, it is worth mentioning that it comes with quilting foot and walking foot among other 7 presser feet. Along with the 60-stitches, the machine also comes with seven buttonhole styles. Singer has a nature of producing immaculate high-end models and Quantum Stylist 9960 is an evidence of it. Since it’s for intermediate and advanced users, it is heavily priced, but if you ask me, it’s worth it. 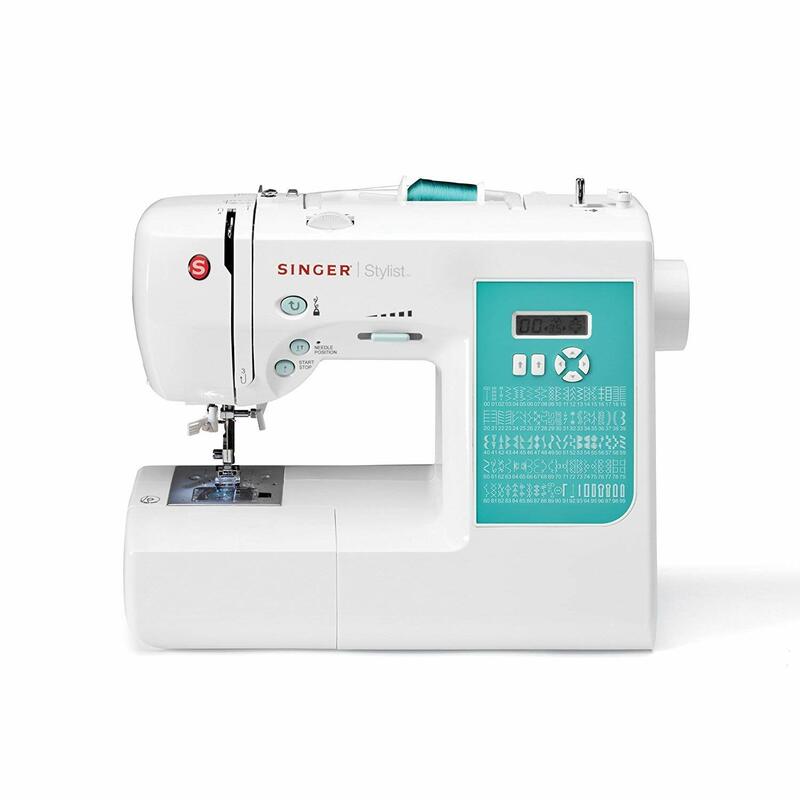 You get 18 presser feet, a power packed machine, automatic needle threader and trimmer, top-loading bobbin, speed controls, and an LCD screen that gives you stats about your stitch length and width, and type. You might think those features are native to any expensive machine and you are right in your own sense, but what really makes this model stand out is its auto-pilot function. When you’d activate that, the machine would carry on sewing without messing with your designs and stitches. As far as the portability goes, it is not portable because it comes with a metal case heavy enough to be not moved from its place. Just because its basic does not mean it isn’t efficient. Packed in a plastic case, the Janome Graceful Gray Basic has 11 stitch types that can let you go for zigzag designs or straight ones, depending on your needs. Not only that, the sewing machine has considerable power to help you make basic pocket squares and hem or stitch a pair of jeans. With the price it comes with, its set of features are commendable, indeed, and the best thing is that you get some accessories with it as well. In the box, you’ll find drop-in bobbin, a free arm, and some extra storage. This product is dedicated to the quilters out there. If you’re one of them, then know that Brother PQ1500SL will deliver just the way you want it. It almost seems as if this machine was built by keeping in mind the conveniences a quilter needs. I’m talking about a 12” by 18” extension table jutting out of a metal case that has a machine capable of 1500 stitches/min. While the rest of the features are typical of an expensive quilting machine such as speed control, auto thread trimmer, needle threader, and positioner, what makes Brother PQ1500SL a marvel is its knee lifer. It is a kind of remote control of the presser foot that lets you control it without leaving the fabric. What’s more is its feed dog setting. In what seems like an impossible free-motion quilting, this setting can come in handy quite a lot. With all the goodness that this machine packs, I can assure you a smooth experience that is only exclusive to it. However, as nothing is perfect, you might experience problems in setting thread tension. So, this is the list of the best sewing machines you can buy right now by clicking the provided links. All of these machines are either for basic purposes or they are versatile. But like I said at the start, before buying any sewing machine, filter it through your needs. Good luck with the needle!